Rocky Fielding put his WBA Super Middleweight title on the line on Saturday against Mexican superstar Saul ‘Canelo’ Alvarez. Ultimately it was not Fielding’s night as he was knocked down four times in the three rounds that he contested as Canelo added a world title at a third weight division. However Fielding’s coach, British coach of the year, Jamie Moore was unhappy with Canelo and his team before the fight due to how much tape was being used. Moore was not sure if the fight went the way it did due to Fielding not sticking to the gameplan or that Canelo was that good that he negated any plans they had. “I knew if it came down to that [Rocky] was always going to be brave but the plan wasn’t to attempt to sit in the pocket as early as the first round. I said you need to keep it long. Use your best attributes. Take the sting out of him. Before you sit in the pocket you need to at least take the sting out of him and then start to use your natural size advantage,” Moore said. 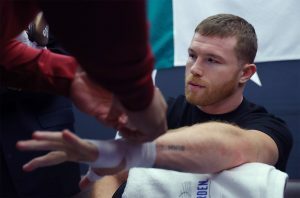 “I’ll have to watch it back but maybe Canelo made him sit in the pocket, put his presence on him, established himself really quickly inside and hurt him straightaway downstairs. So when you’re in with probably the best pound for pound fighter on the planet, then the gameplan and the tactics are easier said than done. These guys are real good at negating stuff that you’re good at. So if he had done what I asked him to do, it might not have made a difference. We don’t know.